Nimblewill has trekked nine of the eleven National Scenic Trails. 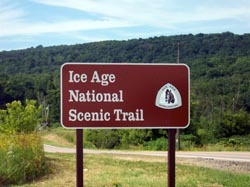 Of the two remaining, one is the Ice Age National Scenic Trail (IAT). It’s located entirely within the state of Wisconsin, where it meanders the leading edge of the last receding ice age. Five distinct ice ages are believed to have occurred on Earth over a period of close to 2.5 billion years (Yes, that’s ten-hundred-million times 2.5! ), the most recent being the Pliocene-Quaternary. During this ice age there occurred periods of ice sheet advancement--and retreat. The last advance ended some 10,000 years ago with the remnants of that advance covering a great portion of Wisconsin. The IAT follows this southernmost line of glacial deposits along a far-sweeping horseshoe shape for nearly 1,100 miles. It crosses a wide variety of lands, consisting of rolling hills, savannas, prairies, and marshes, over private land, through municipal, county, and state parks, plus national forests. Features with strange-sounding name, such as eskers, kettles, moraines, and drumlins, compose the landscape. To date, only 51 individuals have hiked the entire Ice Age Trail. Nimblewill hopes to become number 52! He’ll be keeping journal entries, taking pictures and videos of wildlife, sunrises, sunsets, glacial features, plus folks he meets along the way. 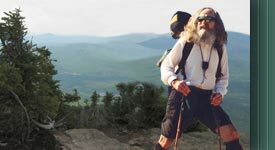 This Odyssey 2012 page lists his tentative itinerary, gear list, and sponsors, and soon to appear--journal entries, photos and videos. Please check back often, then plan on following another predictably unpredictable Nimblewill Nomad adventure. Sure enough, we’ll have a great time!